Since the publication of my YA novel NO SURRENDER SOLDIER (January 2014, Merit Press) people ask where I got the idea for this historical story set on Guam about the after-effects of war on families for generations. In honor of the 70th anniversary celebrating the U.S. marines' liberation of Guam during WWII from the Japanese, I'm posting an excerpt from my novel. In this scene it mentions anonymous generic "reporters" interviewing and writing war stories annually for Liberation Day. In real life, one of those reporters was me when I worked for the Pacific Daily News. These true life stories touched my heart to hear about the atrocities that these kind people on Guam survived. 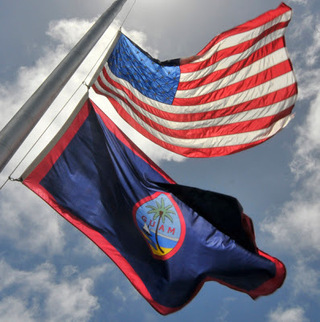 On July 21 when Guamanians remember and celebrate their liberation from their captors. I salute the Guamanians for their indomitable spirit. Excerpt from NO SURRENDER SOLDIER Chapter 9 "Bats"
Later in history class, the guy in front of me kept nodding off, his head bobbing up and down like a fishing cork. I was so tired from going to bed late, then not sleeping good, that I could have slept too. I wish they gave us siestas like in the old days. The open jalousie windows didn’t do any good this time of year. Guam was the same temperature year ’round—82 degrees. But at this time of the year it rained a lot. Since it wasn’t raining today, just threatening too, it was so muggy I could have sliced the air with a knife, like slicing sea cucumbers for sushi.
. . . Concentration camps, forced labor, Merizo massacre, beheadings, rapes . . . I put my finger under the word rapes. There were war stories in the newspaper every July during Liberation Day, but I never read about any rapes before. I read over the section a second time to see if any names were mentioned, like there would be if it were a newspaper article about a crime committed nowadays. The only names I could find were of martyrs and heroes. The manamkos, when they told stories of long ago, they were good things, happy things, funny things that happened. If they talked of war, it was bragging rights about who was a hero, and who hid George Tweed, that American G.I. radioman, the longest, and who sneaked out in his hidden canoe and warned the Americans first of key Japanese positions. When the reporters wrote of war, it was those happy-ending stories that named people’s names in them. The kind of stories kids clipped and took to school for show-and-tell when they were little because they were proud their tatan and nana bihus were heroes. But not bad stuff. Not stories about murders, and people getting their heads chopped off, and people with body parts blown up by grenades the Japanese threw at unarmed Chamorros in Merizo caves. Those people were all dead. No one reported their names. Not the textbooks, not the newspapers. Not unless they came out alive or a hero. “Kiko!” my haole history teacher called. I sighed, then rattled off on auto-pilot what every Guamanian knows, “Spain, United States, Germany, and Japan.” I looked out the jalousies and thought how never again would the words in my history book be just dry, lifeless facts, but rather real things that happened to real people. People I knew.